They were more than just victims. They had names -- Mary Ann, Annie, Elisabeth, Catherine, Mary Jane. They were little girls once with the same dreams and hopes that all children share. They aspired to escape from the mean, dreary lives that they inherited. Four of them married and three became mothers. Whether it was through their own weaknesses and failings or through cruel vagaries of fate, they ended up on the dark streets of the Whitechapel District of London in the fall of 1888. There, they encountered the person who would consign their names to history. It was a terrible way to be remembered. 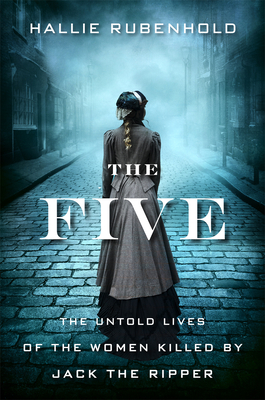 This is a literate, exhaustively researched, and compassionate study of the five canonical victims of Jack the Ripper. It brings into sharp relief the pitiless degradation that the poor were forced to endure and is as much an indictment of a misogynistic and cruelly unjust society as it is the sad chronicle of five lost lives. Polly, Annie, Elizabeth, Catherine and Mary-Jane are famous for the same thing, though they never met. They came from Fleet Street, Knightsbridge, Wolverhampton, Sweden, and Wales. They wrote ballads, ran coffee houses, lived on country estates, they breathed ink-dust from printing presses and escaped people-traffickers. For more than a century, newspapers have been keen to tell us that "the Ripper" preyed on prostitutes. Not only is this untrue, as historian Hallie Rubenhold has discovered, it has prevented the real stories of these fascinating women from being told. Now, in this devastating narrative of five lives, Rubenhold finally sets the record straight, revealing a world not just of Dickens and Queen Victoria, but of poverty, homelessness and rampant misogyny. They died because they were in the wrong place at the wrong time—but their greatest misfortune was to be born a woman. “At last, the Ripper's victims get a voice...An eloquent, stirring challenge to reject the prevailing Ripper myth." "Devastatingly good. The Five will leave you in tears, of pity and of rage."